Saturday, October 29th 2016, 1-3 p.m.
Sonja Grace takes us on a journey 12,000 years ago to the end of the ice age and beginning of a new phase of humanity. She describes in detail from her book ‘Spirit Traveler’ her experiences time traveling to various sacred sites around the world receiving information about what really happened, the ceremonies, people and influences of the ancient past. Sonja discusses the star beings who shaped humanity and how we feel their influence today. Sunday, October 30th 2016, 1-3 p.m.
Are you having a spiritual awakening? Do you feel you have a purpose but can’t figure out what to do? 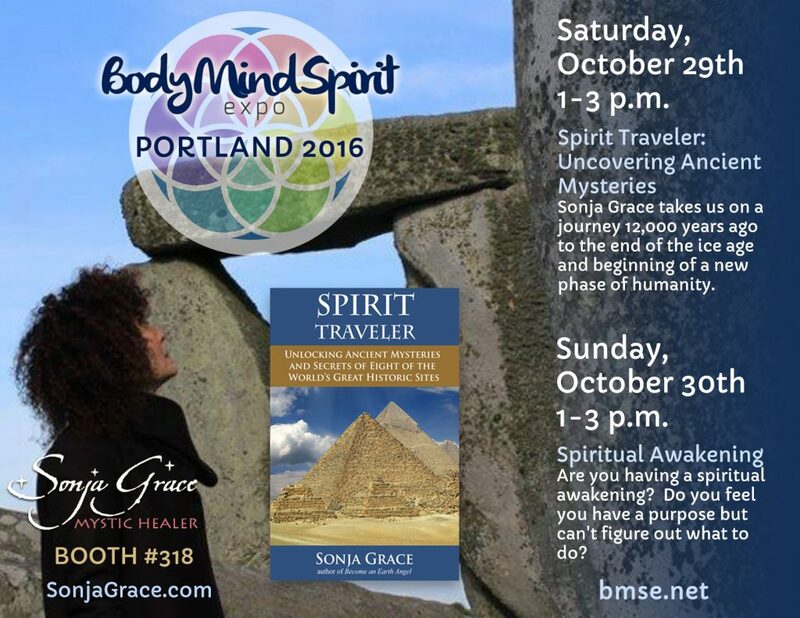 Sonja Grace will guide you through her signature grounding meditation and take you into a higher frequency discovering what it feels like to be in a state of inner peace and navigate a life of service. Sonja shares ancient rituals from her new book ‘Spirit Traveler’ relating these practices to the management of health and well-being in today’s world. Sonja Will be in Booth #318.